Yes, Pax Earth acts and cares for a clean and green environment! Pax Earth has been, to some extent, performing its duty to earth being involved in tree plantation and caring the planted trees for the past few years. 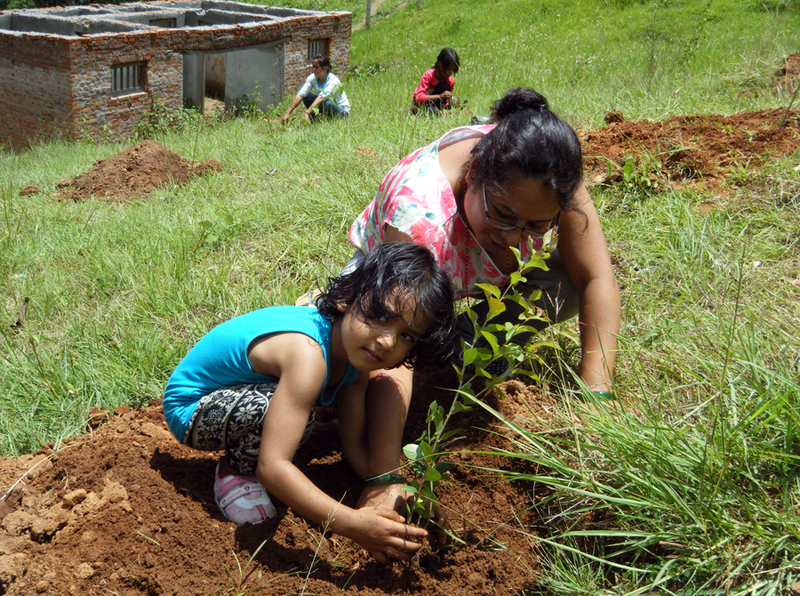 On July 19, 2014, a Pax Earth team traveled to Kanpur VDC of Kavrepalanchok and planted about 165 tree plants at three different schools and a local heritage centre. Yes, Pax Earth cares and acts for a clean and green environment! 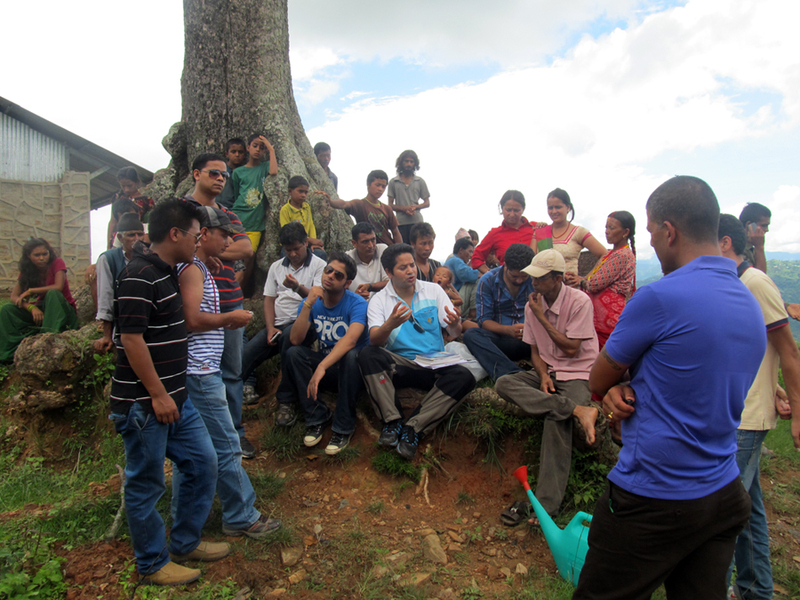 On July 19, 2014, a 19-member Pax Earth team led by coordinator of tree plantation committee Kapil Deuja along with president Sujan Koirala, vice president Guna Raj Pyakurel, secretary Binod P. Mainali, treasurer Bal Gopal Shrestha, board members: Jamuna Siwakoti, Harihar Sapkota, Kamala Basnet and Laxman B. Pahari, hon. members: Nilambar Badal and Kapil Koirala, members: Debraj Ghimire, Sachin Koirala, Dev Raj Karki, Ram Sharan Paudel, well-wishers Manisha Chalise, Rajani Poudyal, Prabin Giri and Yahvi Badal sets off for Kanpur VDC, Kavre from its Secretariat at 8.00am. The team stopped for tea at Nalinchowk, Bhaktapur. During the tea time, they formed three sub-teams: team Seti Devi, team Kalika, and team Raktakali. Team Seti Devi was comprised of Harihar Sapkota (plantation in-charge), Jamuna Siwakoti, Prabin Giri, Kapil Koirala, Ram Sharan Paudel and Sujan Koirala; team Kalika was comprised of Kamala Basnet (plantation in-charge), Manisha Chalise, Guna Raj Pyakurel, Dev Raj Karki and Binod P. Mainali; and team Raktakali was comprised of Debraj Ghimire (plantation in-charge), Sachin Koirala, Rajani Poudyal, Laxman B. Pahari, Nilambar Badal and Bal Gopal Shrestha. 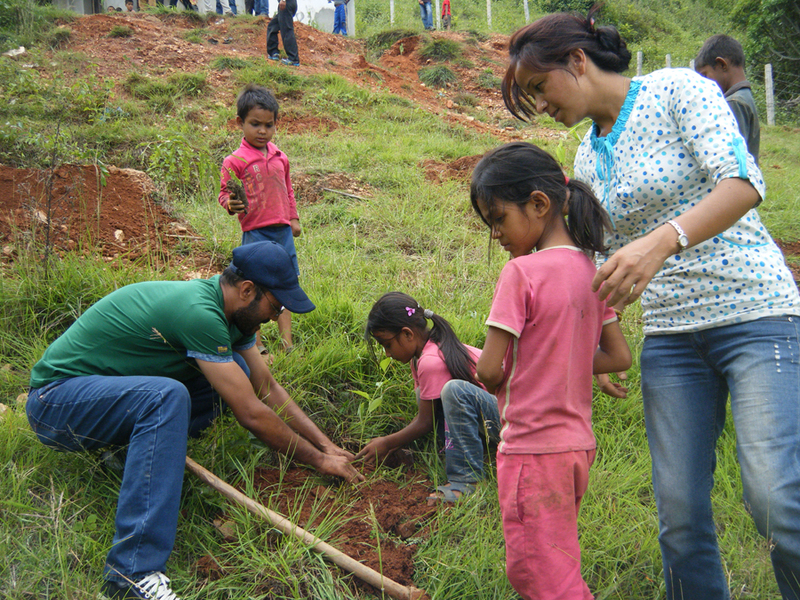 Accordingly, the tree plants were allocated – 51 plants for each school, and 12 for Mane, Bhanjyang. The team stopped at Bhakunde for lunch. Passing through the treacherous roads, the team Seti Devi and team Kalika arrived at Shree Seti Devi Primary School, Khardarpati and Shree Kalika Primary School, Kalikasthan at 12.15pm and 12.30pm respectively. The team Raktakali joined team Seti Devi at Shree Seti Devi Primary School. School management committee chairman Ramesh Mainali and teacher Dipendra Prasad Paudel warmly welcomed each member of the plantation team at Shree Seti Devi Primary School while principal Ram Lal Shrestha and school management committee chairman Gopi BK cordially welcomed each member at Shree Kalika Primary School. Though there was monsoon holiday, a small numbers of students, teachers, school management committee members and community people were present at the respective schools. According to the instruction of plantation in-charge (Harihar Sapkota and Kamala Basnet), the team Seti Devi and team Kalika along with teachers, students and community people planted 51 trees allocated for the respective schools. 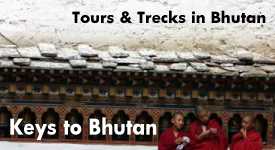 Mainly juniperus, bottle brush, jacaranda, lagerstroemia poni flora, rudraksha (elaeocarpus sphaericus), bodhichitta (zizyphus sativa), Nepali hog plum, juglans regia, guava, camphor, soapberry, Nepali gooseberry, melia azedarach, michelia champaca, cinnamomum tamala, prunus cerasoides and lemon plants were planted at the schoolyards and surrounding. A list of trees planted in each school is presented in Table 1. Tree plantation committee brought most of these tree plants from a government nursery situated at Chalnakhel, Kirtipur and a few plants were purchased from Central Horticulture Centre, Kirtipur. Similarly, well-wisher Prabin Giri and hon. 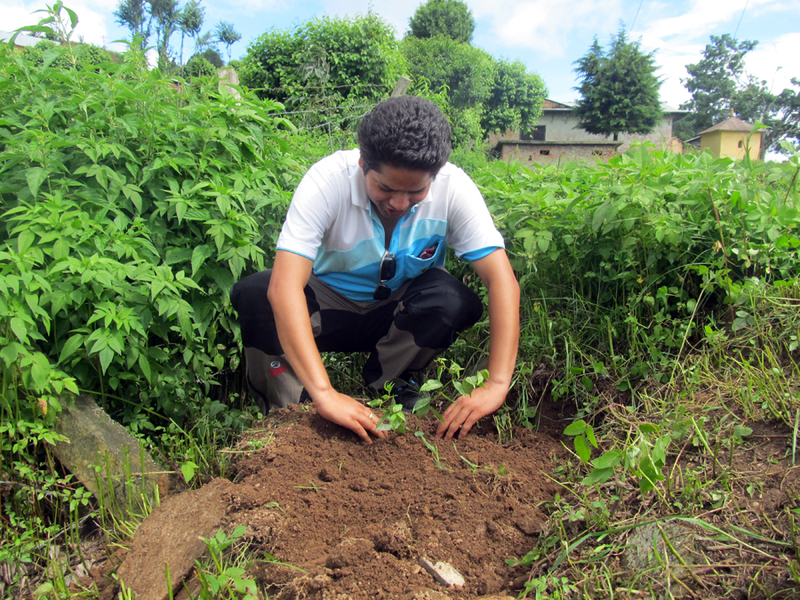 member Kapil Koirala could bring a few highly valued rudraksha plants and bodhichitta plants for the plantation. After the plantation in these two schools, the team headed for Shree Raktakali Primary School. At 2.15pm, entire plantation team arrived at Shree Raktakali Primary School. Principal Hira Kaji Tamang and teacher Hira Kaji Lama cordially welcomed each member of the plantation team at the school. Likewise in former two schools, a small number of teachers, students, school management committee members and community people were present on the occasion. Though team Raktakali was responsible to carry out the plantation, team Seti Devi and team Kalika was prepared for any assistance. According to the instruction of plantation in-charge Debraj Ghimire, team Raktakali, team Seti Devi and team Kalika, along with teachers, students and community people, actively planted 51 trees at the schoolyards and surrounding. Like in former two schools, mainly juniperus, bottle brush, jacaranda, lagerstroemia poni flora, rudraksha (elaeocarpus sphaericus), bodhichitta (zizyphus sativa), Nepali hog plum, juglans regia, guava, camphor, soapberry, Nepali gooseberry, melia azedarach, michelia champaca, cinnamomum tamala, prunus cerasoides and lemon plants were planted in this school too (see Table 1 for the list of trees). After the plantation, Pax Earth handed three dozen literatures to the library of Shree Raktakali Primary School. These literatures were provided by Nai Prakashan and well-wishers Tarun Ranjan Dutta. 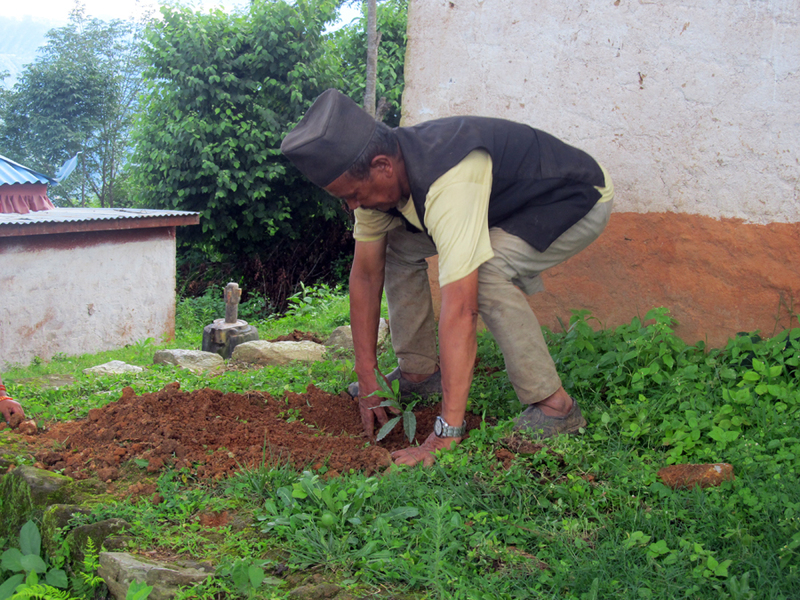 At 3.45pm, the plantation team arrived at Mane, Bhanjyang – a local heritage site of Kot Timal and planted 12 tree plants. 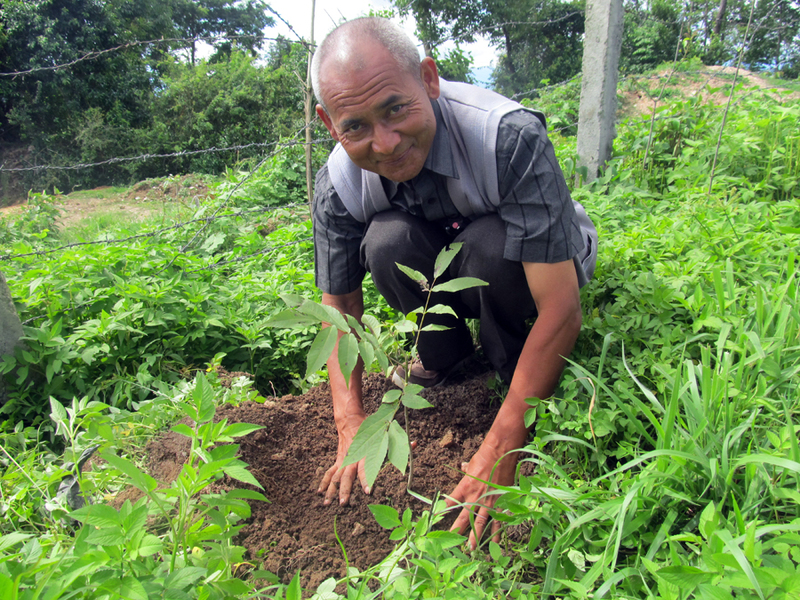 Caretaker of Mane, Bhanjyang Man Bahadur Tamang and a few community people facilitated the plantation. The team left for Kathmandu at 5.30pm after spending nearly half an hour at Dui Pokhari – a local nature spirit. Despite monsoon and treacherous roads, the plantation team could successfully organise the plantation in the three schools and Mane, Bhanjyang. We could plant 19 juniperus, 21 bottle brush, 18 jacaranda, 17 lagerstroemia poni flora, 9 Nepali hog plum, 3 juglans regia, 9 guava, 7 camphor, 6 castanopsis hystrix, 3 Nepali gooseberry, 6 soapberries, 6 melia azedarach, 6 prunus cerasoides, 6 michelia champaca, 7 cinnamomum tamala, 4 rudraksha, 6 bodhichitta, 3 lemon, and 9 different flower plants in total. We also handed a water (showering) container and a mug to each school for watering the plants. The team division was instrumental in carrying out the plantation effectively and efficiently. Pax Earth wishes to see a clean and green environment surrounding the school premises. 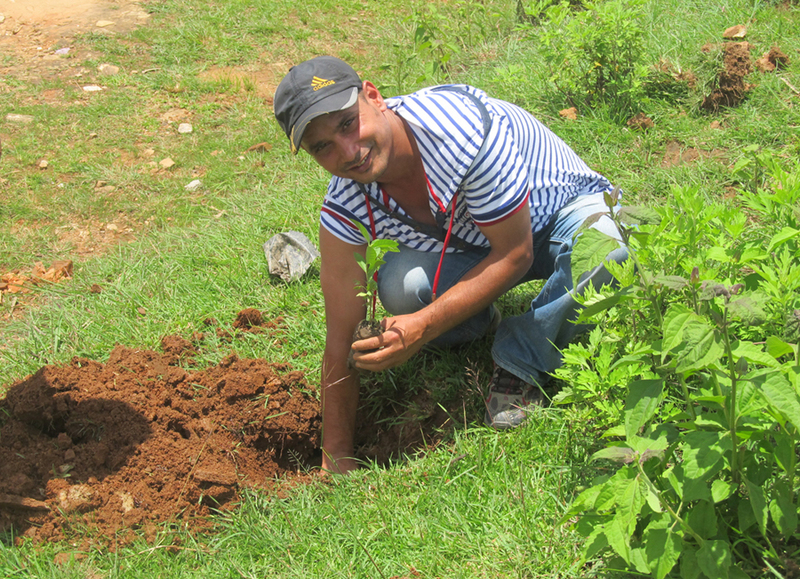 As such, the tree plantations will be continued in future as well. The plantation could not have been successful had not there been some helping hands. 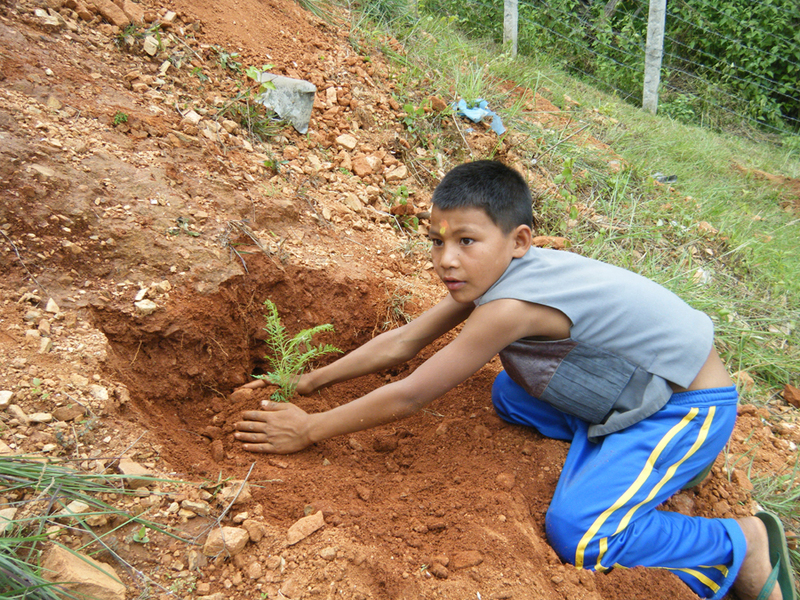 Pax Earth would like to thank all the 18-energetic participants for their active participation in the tree plantation. 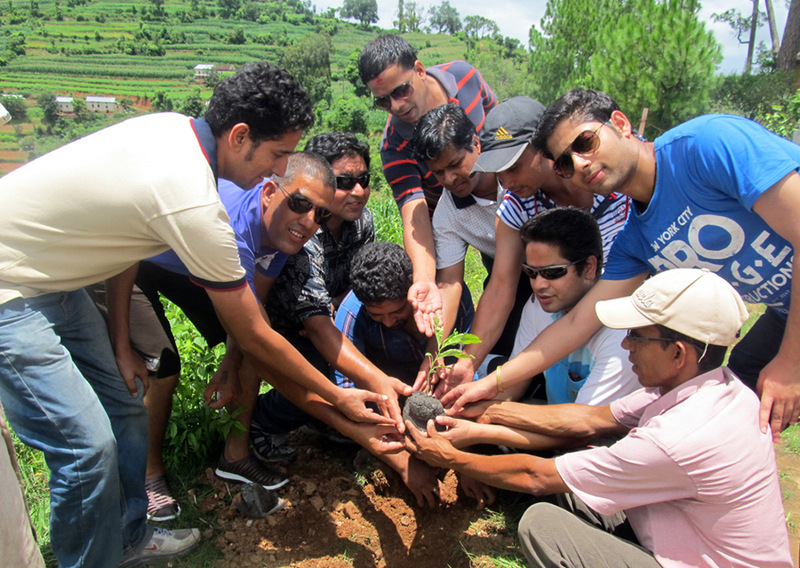 It’s all their sincere effort that collectively resulted into a successful tree plantation program. Hats-off to tree plantation committee coordinator Kapil Deuja and members: Sujan Koirala, Binod P. Mainali, Harihar Sapkota and Jamuna Siwakoti for efficiently carrying out the plantation program. 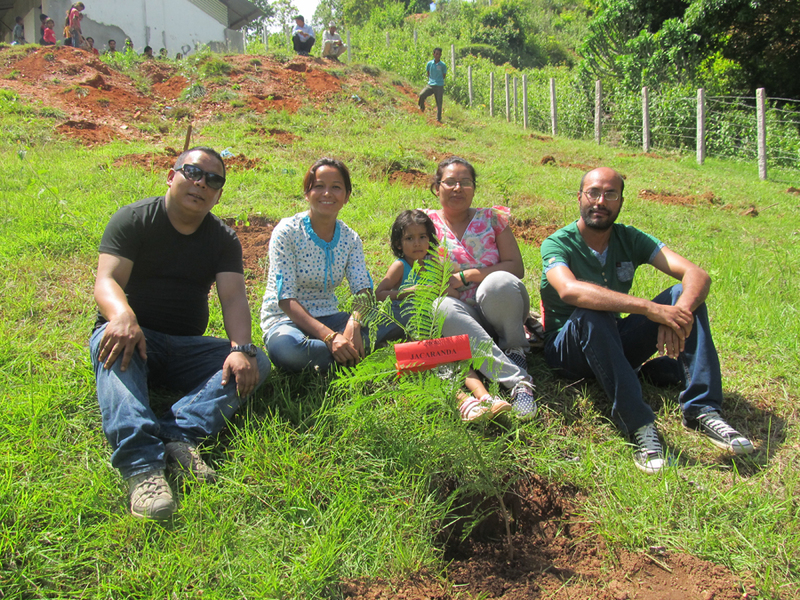 Tree plantation in-charges: Harihar Sapkota (team Seti Devi), Kamala Basnet (team Kalika) and Debraj Ghimire (team Raktakali) deserve a special thank for coordinating the plantation in the respective schools. We would like to thank well-wisher Prabin Giri and hon. 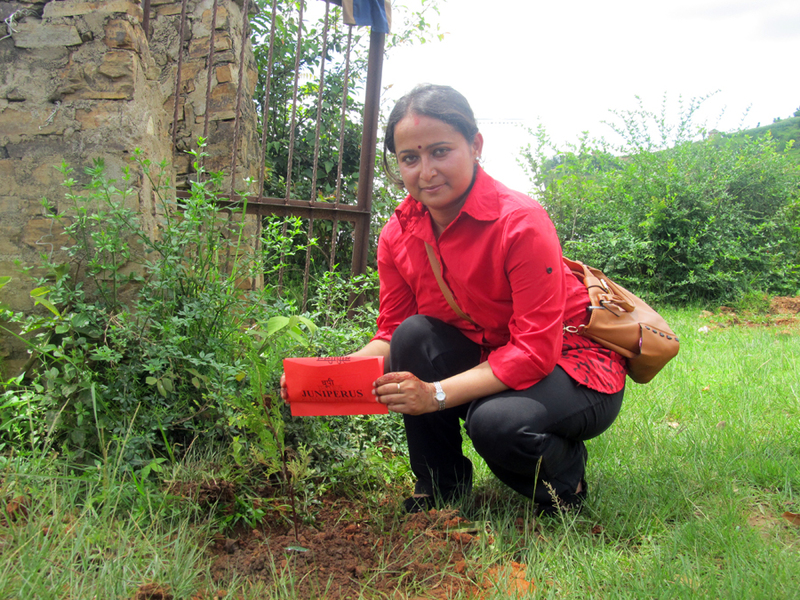 member Kapil Koirala for bringing highly valued rudraksha and bodichitta plants for the plantation. Pax Earth would thank vice president Guna Raj Pyakurel and well-wisher Tarun Ranjan Dutta for collecting some literatures for the library of Shree Raktakali Primary School. Pax Earth heartily thanks the teachers, students, school management committee members and community people for their support and cooperation. Pax Earth must thank drivers Harindra Shrestha and Kursang Tamang for dropping all the members and well-wishers at their respective home-stations in Kathmandu at night.